Just before midnight, the Chicago Teachers Union and Chicago Public Schools came to a tentative agreement, keeping teachers in the classroom instead of on the picket line. There were some compromises on both sides, though some might say the teachers came out with a bit of an edge. This new contract is back-dated to July of last year–when the last contract expired–and ends in June 2019. Existing teachers will get to keep their 7 percent pension pickup, but new teachers hired after Jan. 1, 2017 will have to make that 7 percent contribution themselves, for a total of 9 percent coming from those teachers. Those teachers, however, will get a 3.5 percent salary increase over the base salary in January, and another 3.5 percent in July, an amount which basically offsets the 7 percent. Teachers did get salary increases for education and seniority, known as steps and lanes, restored beginning this fiscal year and going forward. And in fiscal years 2018 and 2019, teachers receive cost-of-living raises of 2 and 2.5 percent, respectively. 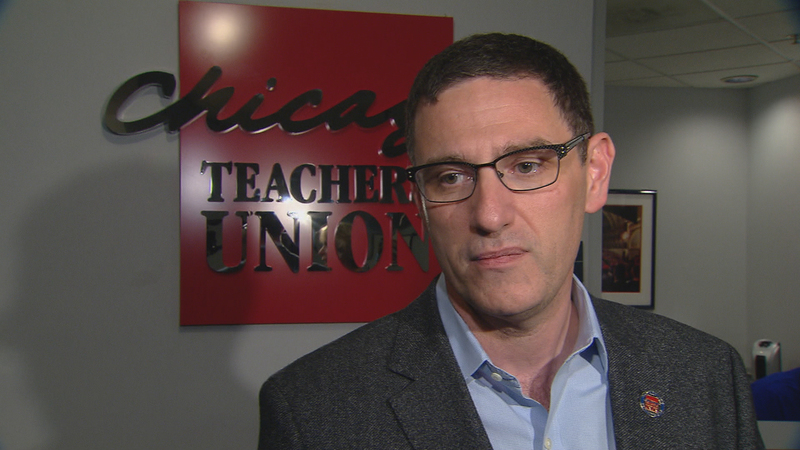 Though many of the officials were up late Monday night wrapping this deal up, we did manage to catch up with CTU Vice President Jesse Sharkey on Tuesday. He said the union shouldn't have had to come this close to a strike to reach a deal. “Parents and teachers were extremely articulate that schools are a priority, and we shouldn’t be holding aside pockets of money earmarked for politically connected developers. If education’s a priority, move that money to the schools,” he said. Other parts of the contract aren't about compensation at all but about the quality of the schools. For example, there's a clause that adds a teacher’s aide to kindergarten through second grade classrooms with more than 32 students. Some of the differences would not typically warrant a strike. Labor education professor Bob Bruno of the University of Illinois at Urbana-Champaign explained the union used its contract to make changes normally made through the political process. “You would normally think of a state legislature, or a city council as a mechanism for putting more funding into a school system. The system needs the money; they used a collective bargaining process in an unprecedented way to find another $88 million, without raising property taxes. That’s a creative use of the process, something that both sides should be complimented on,” said Bruno. The district did gain in a few places as well. For example, the pension pickup will be phased out, but over a longer period of time, since it only starts with new hires. The board wanted a four-year contract, which this is. And teachers did agree to an increase in their health care contributions; that alone could save the district $58 million. The million-dollar question? How much money this contract is going to cost the district. And while there is a contract, budget watchdogs say CPS is not out of the woods. That’s because CPS’s current budget relied on a different contract with the teachers, one in which the district would have saved millions on that 7 percent pension pickup. Though the district will be receiving $88 million from the TIF fund surplus, the question remains over how much more it needs to fully meet its contract obligations with CTU. “The Chicago Public Schools are in big financial trouble,” said Laurence Msall of the Civic Federation. “They did not budget anything for additional spending as a result of this budget. In fact, they had budgeted $30 million in savings. And that’s a budget that’s already over reliant on things coming from Springfield that haven’t been fully settled, like the pension contribution and pension reform. “This agreement is a deal that is fair to all sides, and is the product of thoughtful compromise on both sides to do right by Chicago students. For the District, not only does this deal provide teachers with a raise and secure their pensions, it also achieves meaningful savings that helps stabilize our finances. The contract still has to be approved by the union's House of Delegates, which is expected to meet and vote next week. It will then be up to the full CTU membership to ratify it. Oct. 11: A strike by Chicago Teachers Union members has been averted after the union reached a tentative agreement with Chicago Public Schools and the Board of Education. Oct. 10: Picket signs are printed and teachers say they're ready to walk out as parents scramble to find care for their children. Oct. 7: CTU President Karen Lewis said negotiations between the two sides would continue over the weekend and through Columbus Day if necessary, but as of Friday afternoon, she had “nothing substantial” to report.